There are many reasons why a person loses focus while pursuing their goals. 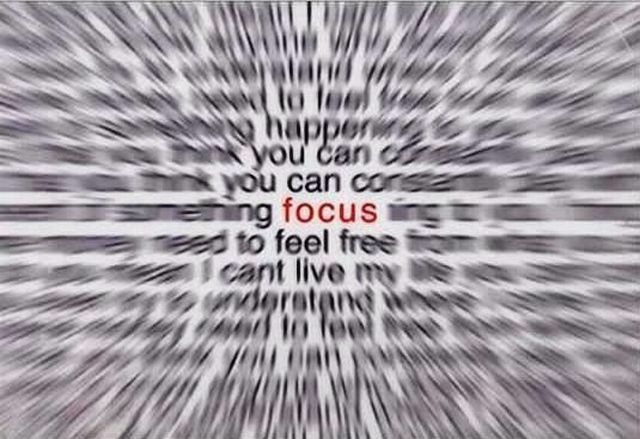 The constant distractions in today’s world mean that maintaining focus can be very difficult. Distraction of work, home, friends, socialising, events and everything else constantly compete for our attention and dedicated time. It takes time to stay focused on achieving our goals and it’s so easy to fail in our attempt to maintain enough momentum, desire, energy and persistence needed to achieve our goals. As a result we often give up and think our goal is unachievable. Another reason why we might lose focus in pursuing our goals is that we may talk ourselves out of pursuing our dreams. When we first begin pursuing our goals, we may be motivated by the fact that we are improving our lives and achieving our wishes and dreams. Shortly after starting the process of taking action towards achieving our goals, we can often begin to question the plausibility of achieving what we want. As soon as we start questioning our ability, we start to lose focus. Specific – Objectives should specify what they want to achieve clearly. You may want to achieve an increase in revenue of 5% in the next 12 months. A 5% increase over 12 months means that each month revenue targets can be measured against a specific goal. Achievable – Are the objectives you set, achievable and attainable? Is the 5% objective for the 12 months achievable? Does the you have the resources, man power and finances to achieve it? Is the 5% objective over a 12 month period realistic or does the company need longer? Does the company have the skills and resources to achieve this over the time period set. In our example the company have set themselves a period of 12 months to achieve the 5% revenue target. Build your Plan. Your plan becomes your road map and helps you determine the best course to follow. Build your plan with enough detail to ensure that your activities are aligned clearly to your SMART objectives and can be tracked. Minimise Distractions. Get rid of as much temptation as possible that deviates from your focus on your goal. Use every method you can think of to remove distractions from your situation and it will certainly help your focus. Ensure that you don’t take on further work unless you are clear that it won’t impact your objectives. Measure Your Progress. You can’t control your progress unless you can measure it. Create a system and timetable to measure your progress against your plan. Record your progress, daily if necessary. This can tell us if we are on track or if we need to make adjustments to either our plan or activities. Be honest with yourself. Moving dates and activities out and recalibrating to ‘Green’ is not the way to hit targets. Prioritise your Goal. Focus on a few goals at one time. Try not to overburden yourself as it will limit your chance of achieving your goal and demotivate you. Concentrate on the important ones first, achieve them and then you can look at addressing the other goals. Work your Goals into your Daily Plan. Do something towards achieving your goals every day. The best way to achieve your goals and maintain your focus is to do something that will make it happen each and every day. Even if it’s only 15 minutes each day, it is better than not doing any goal related activity at all. Give your goal daily attention and you’ll remain more focused and at a better chance of achieving your ambitions. Celebrate your Milestones. Mark your successes and acknowledge your progress towards your desired goal. Set milestones and as you achieve them reward yourself and / or your team. This will motivate you and make you see your milestone in a very positive way. The importance of maintaining your energy and motivation today cannot be overstated. We have seen the impact that the lack of consumer confidence is having on our economy. When people feel uncertain about the future they stop spending money and the result further weakens the economy. The same is true of our goals. When we are not feeling confidant and positive about our prospects we stop spending energy on our goals, which results in set-backs, which further reduce our confidence. The result is a downward spiral similar to what we are seeing in the economy. There is an important difference though, while we cannot control the economy, we can control how we spend our energy. Look out for a future post on how to manage your personal energy!